Pterygium (Surfer’s Eye) most often refers to a benign growth of the conjunctiva. It commonly grows from the nasal side of the sclera, and it is usually present in the palpebral fissure. It is associated with and thought to be caused by ultraviolet-light exposure (e.g., sunlight), low humidity, and dust. The predominance of pterygia on the nasal side is possibly a result of the sun’s rays passing laterally through the cornea, where it undergoes refraction and becomes focused on the limbic area. Sunlight passes unobstructed from the lateral side of the eye, focusing on the medial limbus after passing through the cornea. On the contralateral (medial) side, however, the shadow of the nose medially reduces the intensity of sunlight focused on the lateral/temporal limbus. Pterygium in the conjunctiva is characterized by elastotic degeneration of collagen (actinic elastosis) and fibrovascular proliferation. It has an advancing portion called the head of the pterygium, which is connected to the main body of the pterygium by the neck. 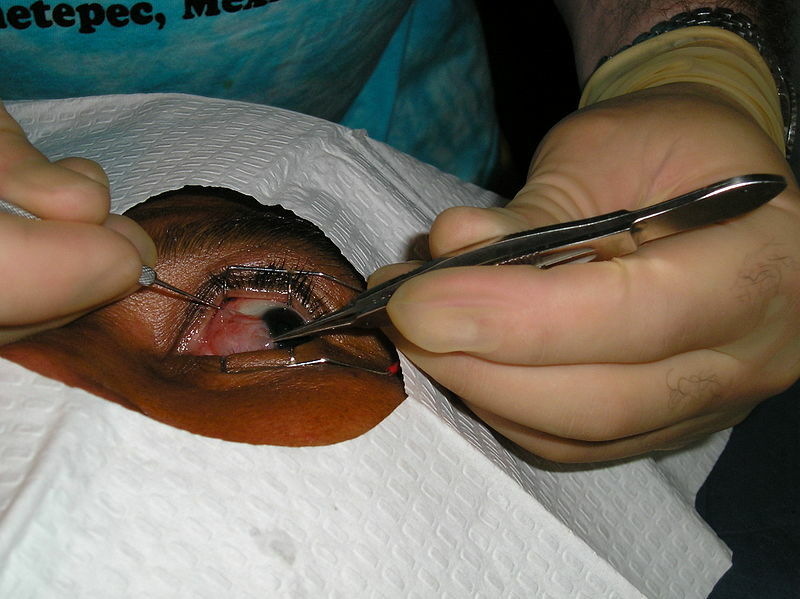 Sometimes a line of iron deposition can be seen adjacent to the head of the pterygium called Stocker’s line. The location of the line can give an indication of the pattern of growth. The exact cause is unknown, but it is associated with excessive exposure to wind, sunlight, or sand. Therefore, it is more likely to occur in populations that inhabit the areas near the equator, as well as windy locations. In addition, pterygia are twice as likely to occur in men than women. Some research also suggests a genetic predisposition due to an expression of vimentin, which indicates cellular migration by the keratoblasts embryological development, which are the cells that give rise to the layers of the cornea. These cells also exhibit an increased P53 expression likely due to a deficit in the tumor suppressor gene. These indications give the impression of a migrating limbus because the cellular origin of the pterygium is actually initiated by the limbal epithelium.